This paper presents an approach which increases the flexibility of a computer-aided design (CAD) model by automatically refining its parameterization and adding new CAD features to the model’s feature tree. It aims to overcome the limitations imposed by the choice of parameters used during the initial model creation, which constrains how the model shape can change during design optimisation. Parametric effectiveness compares the maximum performance improvement that can be achieved using a parameterisation strategy to the maximum performance improvement that can be obtained where the model is unconstrained in how it moves. As such, it provides a measure of how good a parameterisation strategy is and allows different strategies to be compared. 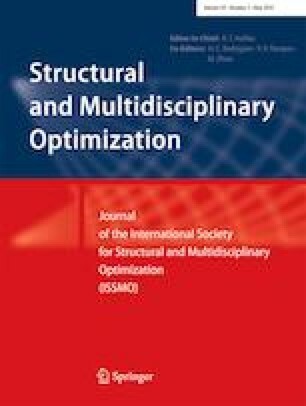 The change in parametric effectiveness due to inserting multiple different CAD features can be calculated using a single adjoint analysis; therefore, the computational cost is essentially independent of the number of parameterisation strategies being analysed. The described approach can be used to automatically add new features to the model and subsequently allows the use of the newly added parameters, along with the existing parameters to be used for optimization, providing the opportunity for a better performing product. The developed approach is applied on CAD models created in CATIA V5 for 2D and 3D finite element and computational fluid dynamic problems. The authors gratefully acknowledge the discussions with Dr. Carsten Othmer on the optimisation results presented in Section 5. This work has been conducted within the IODA project (http://ioda.sems.qmul.ac.uk), funded by the European Union HORIZON 2020 Framework Programme for Research and Innovation under Grant Agreement No. 642959.